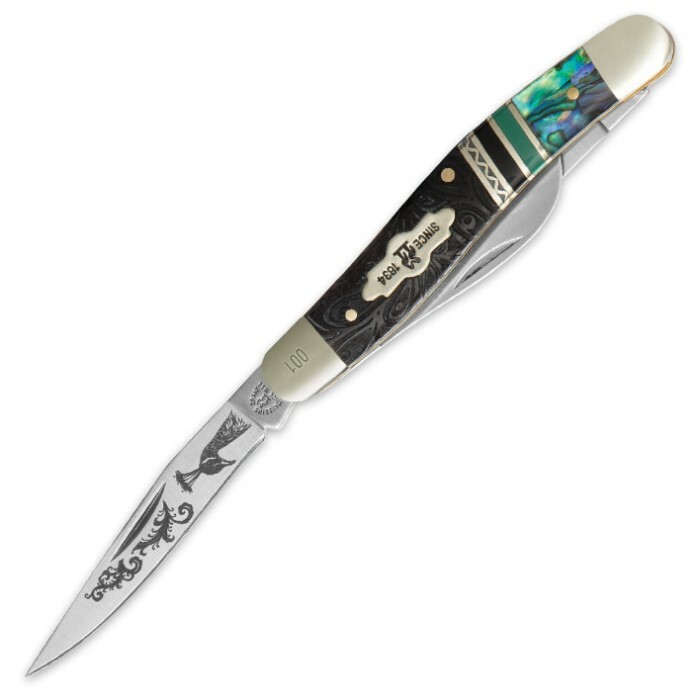 Kissing Crane Limited Edition Peacock Stockman Pocket Knife | BUDK.com - Knives & Swords At The Lowest Prices! Like a handsome peacock strutting his striking iridescent green and blue plumage, the Kissing Crane Limited Edition Peacock Stockman glimmers and gleams with radiant color and texture, sure to draw the awe-inspired gazes of all who see you wield it. 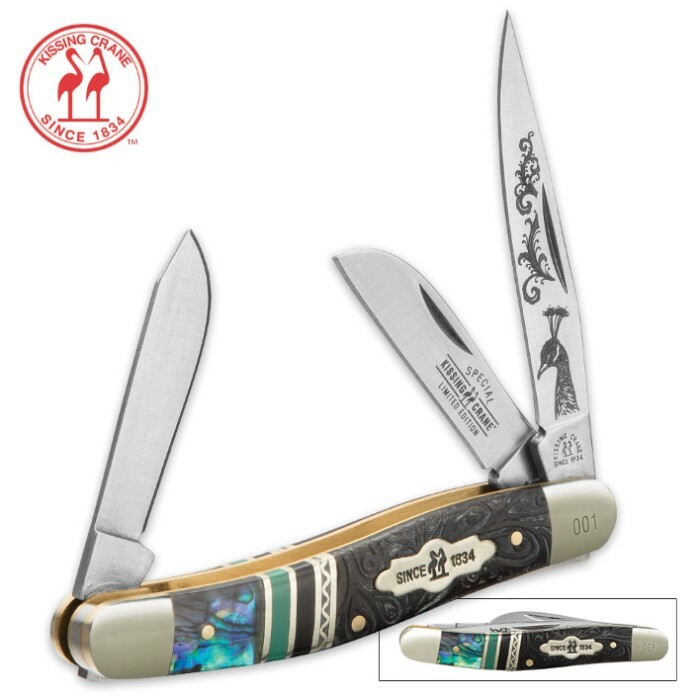 It boasts three razor sharp 440 stainless steel blades - a 2 1/2” clip point finely etched with swirling floral patterns and a stunningly detailed peacock bust; a 2” sheepsfoot that features the iconic “Kissing Crane Special Limited Edition” logo; and a handy 2" spey blade. The elegant handle design rivals even the most impressive peacock tail fan in both pattern and hue. Vibrant abalone, with its torrent of shimmering emeralds, azures, golds and pearls, beautifully offsets rustic black bone, delicately carved with graceful paisleys and other whirling patterns. A stately nickel silver shield stamped with the classic Kissing Crane logo and “Since 1834” is set carefully in the middle of the bone. 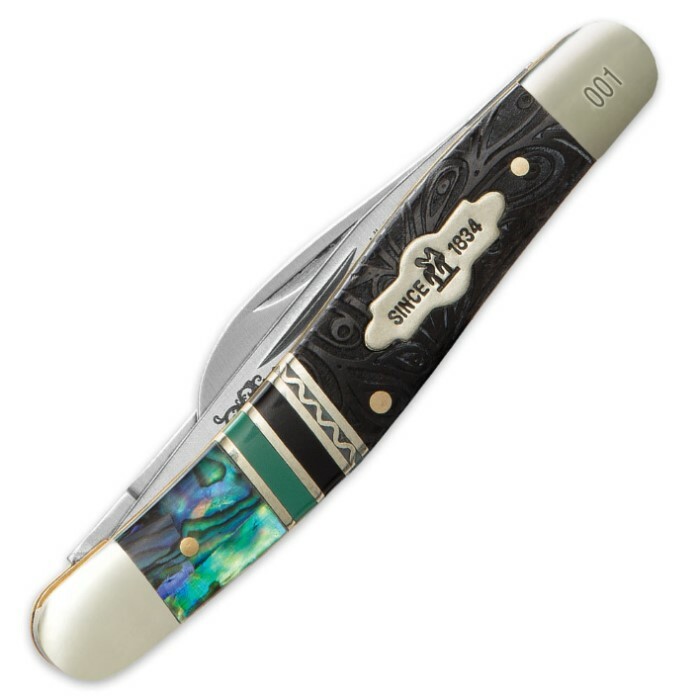 One of the nickel silver bolsters that frame the handle’s mélange of colors and textures is etched with a unique three-digit number that denotes your knife’s place in the extremely limited run. With its exquisite design and special limited status, the Kissing Crane Peacock Stockman is truly the envy of any serious knife collector. At 3 1/2” closed, it fits comfortably in jeans pockets and makes a great everyday pocket knife, as well. Whether you carry it daily or display it, you can rest assured the Peacock Stockman will endure a lifetime and beyond, making it a perfect family heirloom sure to be treasured for generations. Kissing Crane has forged the world’s best pocket knives for more than 175 years, and the Limited Edition Peacock Stockman is no exception. Truly, no collection is complete without one. But hurry - these extraordinary bladed gems are in very short supply and are sure to sell out fast!